1. Scoop the avocado flesh from the skins into a bowl. Add the salad onions, chillies, coriander, cucumber, rice vinegar, sesame oil and a good grinding of black pepper. Use the back of a fork to crush the avocado flesh and mix the ingredients together at the same time. Keep crushing and mixing until you have a chunky, guacamole-like consistency. 2. Separate the Little Gem hearts, picking out 12 leaves that are roughly the same size. Divide the avocado mixture between the leaves. 3. 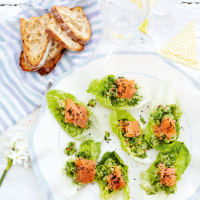 Fold strips of salmon over the avocado, scatter with nigella seeds and sit each leaf on a piece of toast. Serve 2 each with a lemon wedge for squeezing over.